Bangalore officially known as Bengaluru, is the capital of the Indian state of Karnataka. This is the fast developing city in many sectors especially the IT sector. There are amazing employment opportunities are being created in Bangalore in the fast pace, this is one of the amazing reasons why people all over the world are attracted more towards Bangalore. Therefore the need for rental homes has considerably increased. All you must know the proper procedure about renting in this city and How to Create Rent Agreement in Bangalore but before knowing the process lets first discuss What is Rent Agreement. What is Rent Agreement ? Rent Agreement is an agreement in which two parties Owner and Tenant mutually agrees for the rental of property under the given rules and regulations prescribed by the Government of India.It play vital role for both the Tenant and the Owner of the Property. The lease agreements governed by the Rent Control Laws are governed by the rent regulations put up by the State Governments and rents are determined by the State Government. The rent is basically determined by paying attention to the factors like market price of the property, cost of construction incurred, construction time. So here being a simple logic that older the property lesser would be the rent and vice versa. When a lease agreement is signed for 12 months, the tenant gets the ownership of the property for an indefinite period of time. This condition has certainly propelled the number of problems like tenant refusing to leave the flat etc. Court cases can easily take up to ten to twenty years to resolve. For this reason, most landlords prefer rent agreements. They only guarantee tenants the right to live in the rental object for eleven months. Periodic renewal is possible. Draft the Rental agreement while including Terms and Conditions and execute it on relevant value of e-Stamp Paper (forwarded by SHCIL). In Karnataka, the Minimum Stamp Duty for Rental Agreement is Rs. 20/- and preferable Rs. 100/-. Once the Drafting gets Complete, Place the Signature of both Owner and Tenant. Its very Important to Sign at all the Pages of Agreement along with e-Stamp Paper. Mention the Details of Two Witnesses along with their Signatures and with their I.d Proof Document Number. Ideally, one Witness should be from Owner Side and one from Tenant, also Witnesses cannot be a Family Member, It can be your Friends, Neighbors, Colleagues. After that Get your Agreement attested by Notary Public OR Get the document registered at the Sub-Registrar office after paying due registration charges as per State Government. Long queues in Courts, Time Consuming, Costly, Not Legally drafted. Lack of Clauses. People must have face all these issues while getting the Rent Agreement in Bangalore. To minimize these conditions we have set up this Online Portal in which People can have their fully Legally drafted Rent Agreement by just sitting at their home/office. Select your State and Choose the Purpose of Rent Agreement. Provide the Details of Owner,Tenant and about Property to be rented-out. Provide the Modifications in Clauses (if needed). Review the Details and If Satisfy Click on Add to Cart and Place Order. That’s it! Now Legal Experts will draft your Agreement and send it to your Registered E-mail Address, Once Approved we will deliver your Rent Agreement duly executed on e-Stamp Paper on the very Next Day. Allowance of Pets – Make a clause whether the pets will be allowed in Rented Property Or not. Lock in Period – Locking period prescribes the time period within which any of the parties cannot terminate the contract before the sending of the lock in period, if the party do so then he has to pay the rent for the remaining lock in period. So, it is always recommended to modify this term accordingly and wisely. Names of all Tenants – The Name of all the adult tenants should be included while drafting the Rental Agreement along with their signature on Agreement.This act will make each tenant to strictly follow the terms and condition set for the rented property. Limit on Occupancy – There should be a limit set on occupancy that the residence will be use only by the tenants who are involved into the agreement and by their children. This will provide the surety to the owner about the usage of their property and will prevent the unwanted occupants from his property. Duration Of Tenancy – It should be clearly stated in Agreement that what will be the duration of the Tenancy. Repairs and Maintenance – It is always recommended to clearly set that what will be the Tenant’s role for the repairs and maintenance and what will be the Landlord’s role and also there should be a term of allowance of owner anytime for Maintenance or for any major repair within the rented property. Water and Electricity Consumption Bill – It should be clearly stated in Agreement that the water and electricity bill should be paid by the tenant and if ask tenant needs to provide the receipt for the same. Rent and Other Security Deposit – The Last but most important term for Agreement is that clearly stating the amount of Rent needs to pay every month and also penalty if the tenant fails to deposit the Rent on Time and also about the mode of accepting the rent/payment. Ques – Which e Stamp Paper for Rental Agreement in Bangalore we need to choose? Ans – You can use the Article – Lease of Immovable Property OR you can Mention Article – Bond if your Rental Agreement is for 11 months and under description you need to mention – “Rental Agreement”. Ques – What is the Basic Format of Rental Agreement in Bangalore? 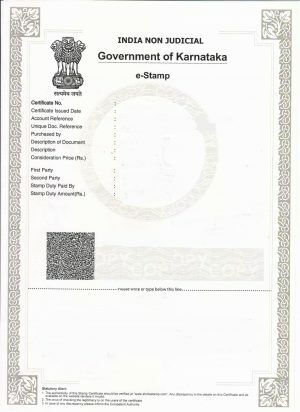 Ques – What is the Stamp Paper value for Rental Agreement in Bangalore? 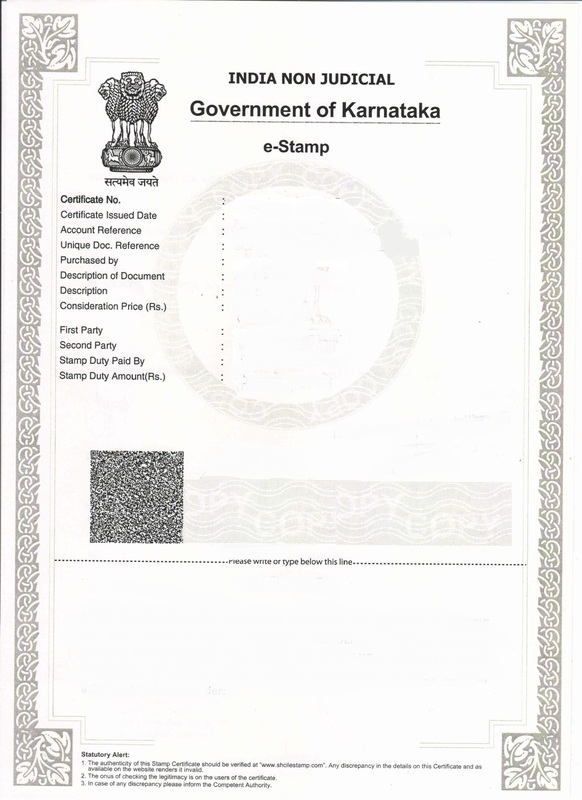 Ans – The minimum Stamp Paper value for Rental Agreement in Bangalore|Karnataka is Rs. 20/- though the commonly used Stamp Paper value is Rs. 100/- for Rental Agreement. Also, after introducing e-stamp paper in Karnataka no fixed denomination has been left by Government. As per Government Articles List, The duty chargeable varies depending upon the amount of rent, lease period and lease granted for amount advanced etc. How does one renew a rental agreement (for bangalore) with a landlord living in USA? Can this be done online as well? What are the requirements? I heard fingerprint scanner is required for this at both ends ... is this true? Or is there a workaround on this? Both landlord and I have aadhar card. Will that suffice?